Alison prefers to meet somewhere quiet to talk, which is surprising in a way because she is a vivacious, slim and attractive woman in her mid-40s who would seem to be the life and soul of the party. “That’s exactly who I am, but these days I have to talk to people in an environment where there isn’t much background noise – I am very hard of hearing!” she explains. Alison needs to wear a hearing aid in each ear and can now hold normal conversations but sounds can mingle together if she is somewhere like a busy cafe or restaurant or a shopping centre. So does Alison have a genetic problem with her hearing or an illness? “No – my increasing deafness is totally down to my own behaviour when I was a teenager. My mum would go on and on at me for going to punk rock concerts and to see live bands. ‘You will really damage your hearing one of these days,’ she used to say. How I wish I had listened to her!” says Alison. When Alison was 15 she became heavily into music and loved punk rock, which was the ‘in’ thing at the time. As well as going to large gigs, open air music festivals and going to see local live bands, she also had her music on as loud as she could when her parents were out – and listened to it at the same volume on her dad’s headphones when they were in and complained about the racket.“I would go out to a local band when I was about 17 or 18 and have a great time – but I did notice I had ringing in my ears afterwards, sometimes for days,” she remembers. When Alison was 21 she married her husband Dave and they bought their own home and settled early into family life. Her two daughters were born within 18 months of each other. “As the girls were growing up I worked as a freelance secretary and administrator and, when they went to school, I did a lot of agency work and audio typing. That’s when I noticed something was going wrong with my hearing,” says Alison. Normally very efficient and capable and a sought after secretary with two agencies, Alison found that her work started to dry up. “The audio typing was really letting me down – I was making so many mistakes and it was getting harder to do. At first, I blamed the equipment but I had to admit that the problem was the same on different machines. I had to go and see my GP for a hearing test.”The test showed significant hearing impairment in both ears and Alison realised that the noises and buzzing that she had been experiencing were not the after-effects of listening to audio typing tapes – she had tinnitus. “I sat in the surgery and just cried and cried. 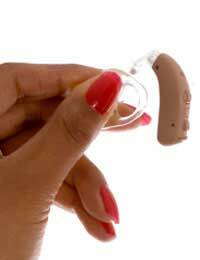 I had visions of having to have a huge box like hearing aid on each ear,” she recalls. Alison started to fall into a serious depression but a chance meeting with a work colleague of her husband’s changed her approach. “I met Sandy, a guy my husband worked with when Dave invited him for dinner one night. I was so angry – meeting someone new really was hard for me. I managed OK and Sandy was really nice, repeating things and listening to what I said very attentively.